Senate Minority Leader Mitch McConnell charged that the current proposal would ease the way to bailouts. Washington (CNN) -- As Democrats prepare to bring the contentious issue of financial reform to the Senate floor as early as next week, Republicans say they have enough votes to block the proposed bill unless changes are made. Senate Republicans say all 41 GOP members will vote against a parliamentary procedure to allow the current bill to proceed. "If [Senate Majority Leader Harry] Reid tries to bring this bill to the floor next week, I will vote against that. I want to force negotiations to continue," said Sen. Susan Collins, R-Maine, a key moderate. "There were serious negotiations going on. The only way I can force people back to the table is to vote against this motion to proceed." Democrats say they will still attempt to move forward with the bill. "If Republicans want to vote against even allowing a reform bill to go the floor, they are more than willing to do so," Jim Manley, a spokesman for Senate Majority Leader Harry Reid, told CNN. In a letter Friday to Senate Majority Leader Harry Reid, the Republicans said they are united in opposition. "We simply cannot ask the American taxpayer to continue to subsidize this 'too big to fail' policy," the letter said. "We must ensure that Wall Street no longer believes or relies on Main Street to bail them out. Inaction is not an option. However, it is imperative that what we do does not worsen the current economic climate or codify the circumstances that led to the last financial crisis." Democrats, who spent most of the week strongly rebutting a charge by Senate Minority Leader Mitch McConnell, R-Kentucky, that the current proposal would ease the way for companies to get a government bailout, also disputed that their bill continues the "'too big to fail' policy." "This bill has been written specifically to end any notion of any kind of a bailout by the American taxpayer again," Senate Banking Committee Chairman Chris Dodd, D-Connecticut, said Thursday. "Our bill stops bailouts by imposing ... tough new requirements on Wall Street firms," Dodd said. "Being too big and too interconnected will cost these firms dearly. And should that not be enough, our legislation, regulators can use the new powers in our legislation to break these firms up before they can take down the economy of our country." Manly said the Republicans' letter "is a thinly veiled effort ... to stall as they try to come up with a strategy to defeat the bill." Democrats say they are prepared to start debate but would need at least one GOP senator to vote with them if Republicans filibuster. Bipartisanship cannot mean simply allowing lobbyist-driven loopholes that put American taxpayers at risk. "At this point, I say to my colleagues, bring me your ideas, let's work on this together, let's debate the bill and pass strong Wall Street reform to protect our country from the kinds of abuses that lost so many their jobs, their homes and their life savings. 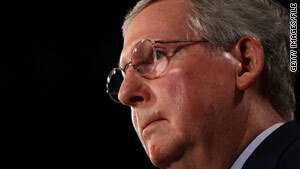 But let's not engage in nonsense," Dodd said in reaction to the Republicans' letter. Senate Democratic leaders and administration officials are working hard to try to persuade several Republicans, including Sens. Bob Corker, R-Tennessee, and Judd Gregg, R-New Hampshire, to break ranks and vote with them. Meanwhile, President Obama pushed for action on the issue at an event with a group of his economic advisers and in an e-mail sent to his supporters. Specifically, he said, there needs to be strong reform and more accountability regarding trading of complex risky investments called derivatives, which were one of the major causes of the economic meltdown. "I hope we can pass a bipartisan bill, but bipartisanship cannot mean simply allowing lobbyist driven loopholes that put American taxapyers at risk. That would not be real reform," he told the meeting of his advisers. Asked by a reporter whether he would veto legislation if the derivatives reforms are weakened, Obama said, "I want to see what emerges. But I will veto legislation that does not bring the derivatives market under control in some sort of regulatory framework that assures that we don't have the same kind of crisis that we have seen in the past." CNN's Kevin Bohn contributed to this article.